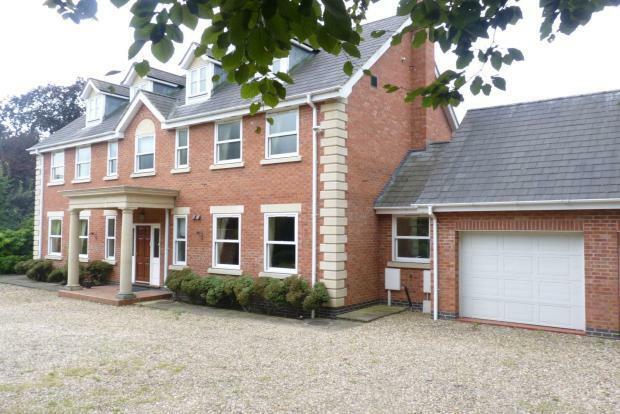 5 Bedroom Detached House To Rent in Leicester for £2,250 per Calendar Month. Here is a rare opportunity to rent a detached 5 bedroom detached house set back from Elms Road in the sought residential location of Stoneygate. The property is accessed down a long driveway off Elms Road, with the house having a brick wall and ornate wrought iron entrance gates that open up to the gravel driveway and front garden. The driveway has ample space for multiple cars with the double garage to the rear section of the front garden and wooden summerhouse. A range of mature shrubs and evergreen foliage boards the right side of the entrance. The entrance to the front door has stone pillars to either side and opens out to the main hallway which leads to the main reception room/lounge that runs from the front to the back of the house, and patio style doors giving access to the rear garden. The hallway benefits from a downstairs cloakroom with WC and hand basin and the hallway leads onto reception room 2; the dining room, with views over the rear garden. The kitchen comes with an extensive range of pine fronted wall and floor cupboards, and matching marble topped island. One of the key features to the kitchen is the high gloss green AGA gas cooker, which helps to form a, â€˜heart of the homeâ€™ feeling. The space offered by the kitchen has ample room for additional separate everyday dining, and has a further reception area with a conservatory that offers views to all sides of the rear garden. Laundry facilities are provided by a separate utility room that also allows for extra stage facilities with a range of cupboard space. The rear garden has been landscaped on different levels with a wide range of mature shrubs, tees and plants. The calm relaxed ambience created by good design has enhanced by the cooling feel of the pond. With the rear garden are two garden sheds; a greenhouse and brick built barbeque area with paved patio. By negotiation with the landlord a gardener can be arranged to keep both the front and rear garden in good order. To the first floor of the house are three double bedrooms with the master bedroom being fully fitted with wardrobes, drawer units and dressing area all in solid wood. The en-suite comes in two sections with the main part having hands basins, mirrored wall, bath and shower cubicle. The second part has the having the WC and bidet. Bedroom 2 has fitted wardrobes and drawer units with an en-suite comprising of a WC, hand basin and shower cubicle. Bedroom 3 is similar in size with fitted wardrobes and drawers. The first floor is finished with a family bathroom with three-piece suite: WC, hand basin bath and overhead shower. The central staircase on the first floor leads up to the second floor with two further spacious rooms either side of the staircase. Bedroom 4 is an additional double and the room opposite can be used in a variety of ways: presently fitted out to be an office or study, but with ample space to be an additional bedroom or occasional room. The versatile range of accommodation on offer truly has to be seen to be appreciated, and Frank Innes Lettings cannot recommend highly enough the need to arrange an internal inspection.